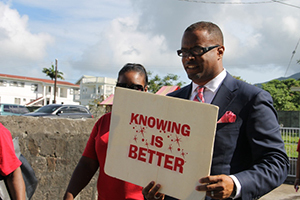 NIA CHARLESTOWN NEVIS (December 02, 2014) – Persons unaware of their HIV status, will soon have the opportunity to test at select health care providers on Nevis for same day results. The service to be introduced shortly, is a new initiative planned by the Ministry of Health on Nevis. 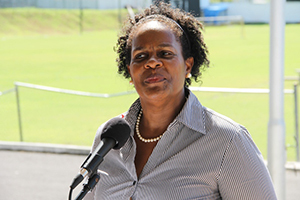 The disclosure came from Medical Officer of Health/HIV Clinical Coordinator in the Nevis Island Administration (NIA) Dr. Judy Nisbett, when she delivered remarks at a rally hosted by the Ministry of Health at the Elquemedo T. Willett Park on December 01, 2014. 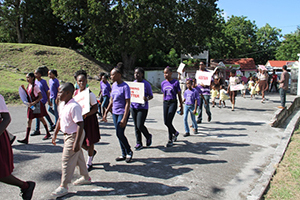 The event followed a march through Charlestown in observance of World AIDS Day. The theme was “Closing the Gap in HIV Prevention and Treatment”. “We pledge as a Ministry to continue our efforts to close the HIV testing and treatment gaps, so that persons who are unaware of their HIV status can be tested and begin to receive adequate care. “Shortly, we will be rolling out a new initiative – Point of Care Testing – which will enable everyone to visit the offices of selected health care providers, have their HIV test done and receive their results in 20 minutes. This new programme will increase access to testing and facilitate early linkage to treatment,” she said. Dr. Nisbett underscored the fact that despite dwindling resources from international donors, the Ministry would do all it could to ensure that persons living with HIV, including children, would have access to a constant and affordable supply of HIV medicines. “We are totally committed to this, recognising that effective treatment of HIV patients prevents the spread of HIV infection,” she said. The Health Official used the opportunity to urge the public to continue to work assiduously with the Ministry in the global effort to “closing the gap to arrive at Zero new infections, zero discrimination and zero AIDS deaths” by 2013. 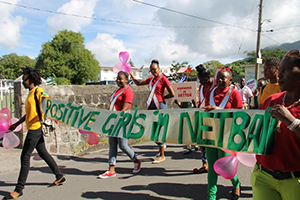 Dr. Nisbett noted that the Ministry of Health through the 13-year-old HIV Unit, had introduced a number of programmes aimed at preventing the spread of HIV and increasing access to treatment. The prevention and education programmes were ongoing at schools, public health facilities, workplaces and communities and Health Care Providers had been trained in Voluntary HIV Counselling and Provider Initiated HIV Counselling. She stated that those services were available at all health care centres, the HIV Unit and the Alexandra Hospital. The HIV test remains cost-free at the Hospital’s Laboratory. However referrals have to come through the health centres, HIV Unit, any doctor’s office and on testing days held in June and December each year. Antiretroviral medicines and medicines used in the treatment of HIV-infected patients were also cost-free and nutritional assistance available to those patients who were in need of it. Dr. Nisbett also said a group of skilled persons were available to assist persons infected with HIV. “A multi-disciplinary clinical care team established several years ago, ensures that each patient testing positive is linked to treatment services and receives optimal medical care. All this is done while maintaining a high level of confidentiality,” she said.